This Magento 2 tutorial looks at message queues in Magento 2, and specifically the built-in support in the Enterprise Edition (EE). Please note that the functionality discussed is not available natively in Community Edition (CE). The article also assumes that you have installed and configured RabbitMQ. It is also useful (but not essential) to enable the web interface to monitor your RabbitMQ server. This is available with the management plugin. I’ll be discussing how to configure and build message queues in Magento 2. Then I’ll demonstrate how to create the message queue topology using one of the examples in the tutorials referenced above. I’ll then run through the process of creating a Magento module to publish and subscribe to a message queue. Note that all the code I use in my examples is available on GitHub. 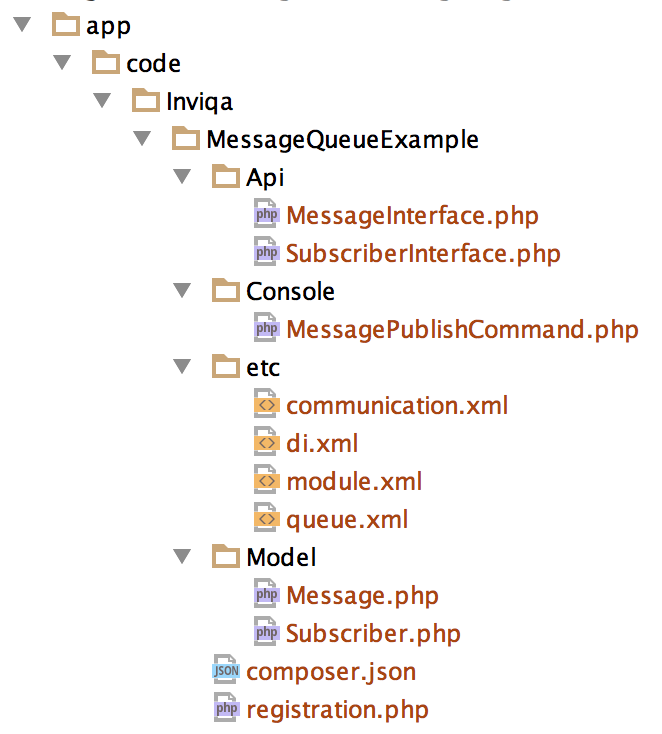 magento/framework-message-queue Contains abstract message queue code that's shared by all implementations. magento/module-message-queue Contains the code needed ro list and run consumers. Contains a list of topics and handlers. Intended to contain message queue information shared between implementations. Contains a list of message brokers with queue and consumer definitions. Contains implementation specific information i.e. defines whether db or ampq adaptors should be used. The Magento 2 documentation already does a good job of describing the topic/handler and broker/queue elements and their attributes. So to avoid repeating that information here, this article will instead show how they are used by example. As you can see from the table in the ‘Code Points’ section above, two adaptors are provided by default. queue Contains a list of queues. queue_message Contains message data in JSON format. The installer scripts create the basic tables and insert entries into the queue table according to the latest queue configuration. As of version 2.1, there is no facility to keep the queue table in sync with the queue configuration, although this should be solved in a future release by converting the data installer script to a recurring installer script, as that change has already been made to the AMQP adaptor module. The database adapter module also introduces functionality to clean up or retry messages after certain time intervals. 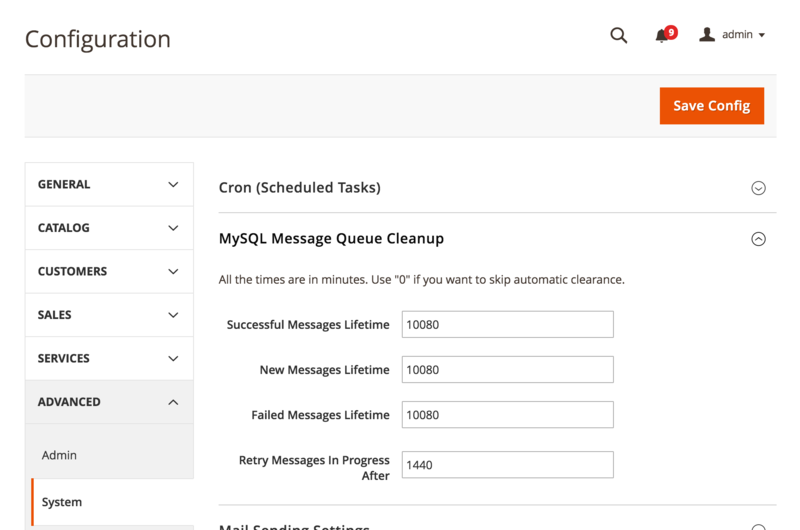 These settings can be found in Stores > Configuration > Advanced > System > MySQL Message Queue Cleanup. Below is a screenshot of the available settings. The AMQP adaptor defers the message handling to a AMQP compatible application, such as RabbitMQ. As such it does not require the additional tables and cleanup functionality of the database adaptor. Instead of creating database tables the installer scripts create the necessary exchanges, queues, consumers and bindings in RabbitMQ according to the latest queue configuration. These are kept up-to-date by using a recurring installer script, which means that any changes to configuration in queue.xml are transposed to RabbitMQ when running the Magento cli tool with command magento setup:upgrade. By default Magento creates a single topic exchange called magento which can be used in the queue.xml configuration. The following is a slightly modified diagram from the fourth RabbitMQ tutorial. It represents the topology of a direct exchange. If you are wondering why such a basic topology has been used, the answer is that this is the limit of the complexity of what can be achieved since configuration changes were introduced in version 2.1. In earlier 2.0 versions, the configuration (although not perfect) was more flexible and allowed multiple bindings and wildcard binding, thus giving greater access to the features of a topic exchange. In version 2.1, this flexibility was removed in favour of a simpler approach. The 2.0 version of the documentation shows what was previously possible. Once a queue and bindings have been set up, the next step is to publish a message. This can be demonstrated by adding a publish command to the Magento cli tool, which the following code will work towards. The first thing to create in the module folder is the configuration file etc/communication.xml and etc/queue.xml. For this example the direct exchange configuration (see above) will be used. This simple interface defines two methods that need to be implemented that get and set a string message. This class implements the methods in MessageInterface, storing the message in an instance variable. This configures Magento to return an instance of the Message model whenever the MessageInterface service contract is requested. This looks like a lot of code, so needs to be broken down a bit. Here the classes that will be needed by the console command are imported, including the MessageInterface created above and the framework message queue PublisherInterface. Here the class is created and some class constants are defined to avoid duplication. Then the PublisherInterface and MessageInterface are injected into the constructor. Here the execute method is overidden from the parent to provide the main functionality. The message and topic arguments are retrieved from the console input, added to the message transport, then the transport is published to the topic. Additionally a message is written to the output to describe the action. If an exception is thrown by the publisher that is written to output instead. This method extends the parent configure method to define how the command should be run. setName sets the command name to queue:message:publish and setDescription sets a description of what the command will do. These will appear in the list of commands when running magento list. setDefinition defines the input arguments required, which in this case are a message and a topic. > magento list | grep "queue:"
> magento queue:message:publish "Orange" "orange"
Published message "Orange" to topic "orange"
> magento queue:message:publish "Green" "green"
Published message "Green" to topic "green"
The screenshot shows that (as expected) there is one message ready in queueOne and one message ready in queueTwo. > magento queue:message:publish "Test not defined" "notdefined"
Specified topic "notdefined" is not declared. This is a limitation imposed by Magento rather than RabbitMQ. If the topic is not predefined it will throw an exception. This is contrary to the default behaviour of RabbitMQ which allows messages to be published to any topic (within limitations) but will discard the message if there are no matching bindings. So far the focus has been on creating the correct configuration and then publishing a message using the Magento message queue publisher. To receive and process messages that are in a queue a consumer must be running to listen for any new messages. This can be done using the cli tool and is described below. This simple interface defines a single method that need to be implemented to process a message. It is essential that the message uses the same format/class as when it was published. In this case it is expecting a MessageInterface derived class. This class implements the processMessage method in SubscriberInterface, and just echos out the message (for demonstration purposes). Here the consumers are started and each pick up the messages that have been routed to their respective queues and output them to the terminal. The consumers need to be run in separate terminals because, unlike other commands in the cli tool, once they are started they will run until they are explicitly cancelled into the terminal. This gives a clue as to how they are intended to be used in a production environment i.e. each consumer will need to be run as a background process, possibly supported by something like Supervisor. Phillip has more than 13 years’ experience designing and building web applications, with the last five years spent exclusively working on Magento projects at Inviqa. Prior to that, he worked in a variety of roles including server and client-side development, client/server-side integration and interface design.